Only 10 more days to Christmas (or less!). Don’t Panic! Gifts for musicians that fit in a stocking. The holidays are near. What should you get for the guitarist in your life? Here’s some ideas based on what I’ve asked for, received or wished for over the years. Some of these are items I’ve newly discovered. Everything falls under the category of small enough to fit in a Christmas Stocking and consequently, relatively inexpensive. Picks. 1 See my recent article on flat picks. You can by between 3 and a dozen picks for between $2 and $10. Very inexpensive and small. You can get a lot of picks into a stocking. If you’re giving picks, you might also consider pick holders. There are pick holders for the guitar and holders that go on a microphone stand – but could also be used on a guitar stand. There are also pick holders for pockets or key rings. 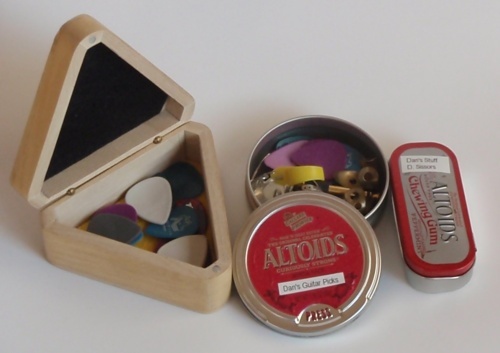 If you are into making homemade gifts – or perhaps if you have children and want a craft project present for your spouse or children’s favorite aunt, uncle or grandparent who plays guitar – how about a pick box. Here are some picks of some of the many pick boxes I use. I am particularly fond of small tins – Altoids tins are excellent. You are your children can decorate the outside of the box. I like to line the inside of my pick boxes with felt. It makes it easier to grab a pick out of the box. It’s surprising how many different designs people can come up with for a capo. Capos are great for singing guitarists or someone accompanies singers on the acoustic guitar (they can be used on electric guitars too). My current favorite capo is the Shubb Deluxe. A simple design that is easy to get on and off the guitar and works very well. Instrument straps come in a wide variety of materials, styles and prices. You can purchase a polypropylene adjustable guitar strap for under $10. Rolled up it should fit in a Christmas stocking. You can also purchase hand crafted wide leather guitar straps for nearly $200. Even rolled tightly, these would be difficult to fit into a stocking. The good news is there are many other choices which are less expensive and might fit in a stocking – or maybe you need a bigger stocking. If you are purchasing a strap for an acoustic or electric guitar player you’ll have plenty of choices. But if the musician you are buying for plays a resonator guitar, mandolin, electric bass, banjo, classical guitar or ukulele that there are special straps made for each of those instruments. Be sure you get the right type of strap for the instrument. Electric guitar players may appreciate accessories that keep the guitar strap from slipping off the strap button. My favorite solution is the Schaller Strap Lock system. These are about $15. This is the same as the Fender Strap lock which is installed on some models of Fender guitars (came on my American Deluxe Strat). Dunlop also makes a strap lock system. I switched to the Schaller because I like the design better. The Dunlop’s made the strap appear to be attached to a rod held off from the guitar. A less expensive solution, and still a great stocking stuffer are Dunlop Plastic Straplocks. These may be more difficult to find. Elderly Instruments carries them. They’re about 10% the price of the metal strap locks. Unlike the metal locks, there is no modification to the guitar required. Clip-on electronic chromatic tuners detect the vibrations of the instrument when the spring clip is clamped to (usually) to the headstock of the instrument. The advantage is that there is no microphone and thus no interference from room noise. I purchased an Intelli-touch clip on chromatic tuner when there were few choices for this design. It was somewhat expensive, but worth it. Now there are many choices in this style that are reasonably priced, such as the Snark. You can also purchase more traditional chromatic tuners such as the Korg shown here. It’s small enough to fit in a stocking and reasonably priced. However, you might consider giving a credit for a smartphone chromatic tuner app. In fact I have a free Android app for my phone which does a better job than my chromatic tuner using a microphone – but it’s not as good as the clip on. Most of the images in this article have affiliate links to product pages at online retailers where I am an affiliate. Click the images to see pricing and details. No purchase necessary, but any purchase is appreciated. There are some images of items I own that don’t link to product pages and some links to retailers where I have no relationship.